Hydro-jetting may be the best way to eliminate a stubborn clog. It contains no caustic chemicals and is a simple and effective way of blasting out obstructions. 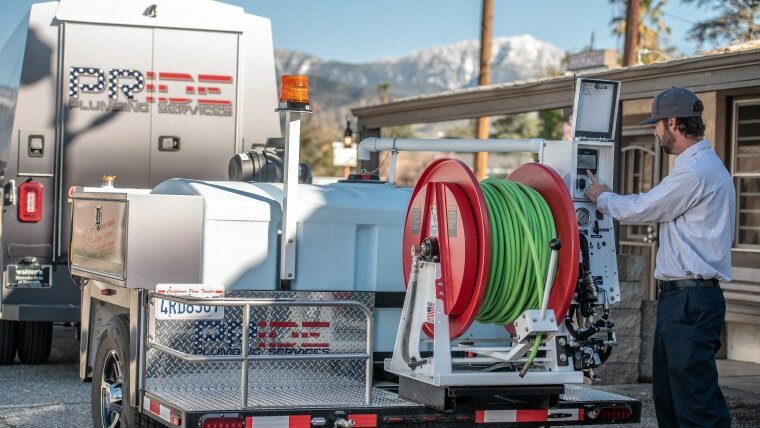 Pride Plumbing has successfully cleared plumbing with this method all throughout the Inland Empire, and we’re looking forward to working with you for your specific needs. A bad clog can create backup, cause your plumbing fixtures to be unusable and create a bad smell or damage in your home. And sometimes, despite your best efforts, the clog is too deep to plunge and too large to use a snake. There are a lot of questions surrounding hydro-jetting, so take a look at some of the concerns below to see them answered. #1 Will hydro-jetting damage pipes? Not at all; hydro-jetting relies on high pressure water that does not damage pipe materials. There are no caustic chemicals that could weaken them. If for some reason your pipes are too old and/or damaged, our plumber will inform you and present alternative options. #2 Will hydro-jetting be more efficient than a drain snake? The downside of using a drain snake is that it can often break up a clog, but some parts of the debris will remain, risking a recurring clog. Hydro-jetting, on the other hand, is very thorough and it is very unlikely a clog will recur in the same place. #3 Can I hydro-jet myself? You may need a camera inspection beforehand to determine the exact cause of the clog and know the best course of action. We will be the only plumbing company you need to call for effective hydro-jetting services. Call us at (909) 372-1239 today!